As summer turns to autumn there are very few plants still flowering in our garden for insects. 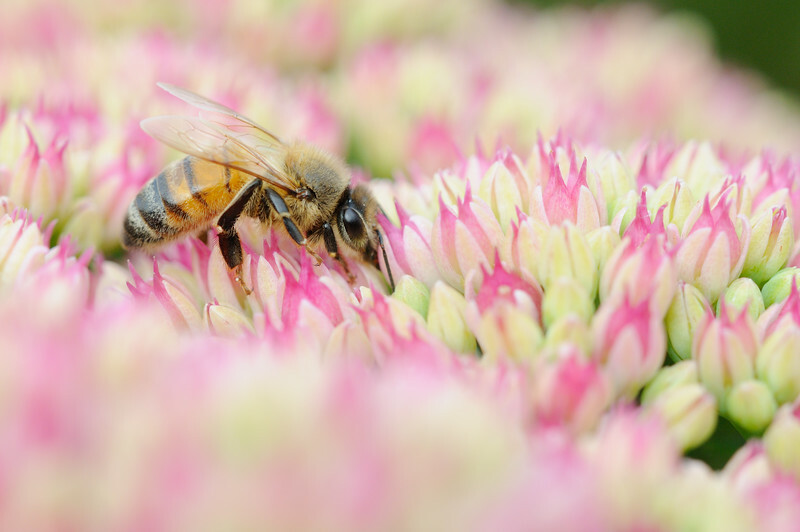 A few years ago we planted a sedum to provide some much needed food for honeybees and bumblebees which still forage at this time of year. It's hugely popular with lots of invertebrates and provides me with great opportunities to photograph the honeybees. 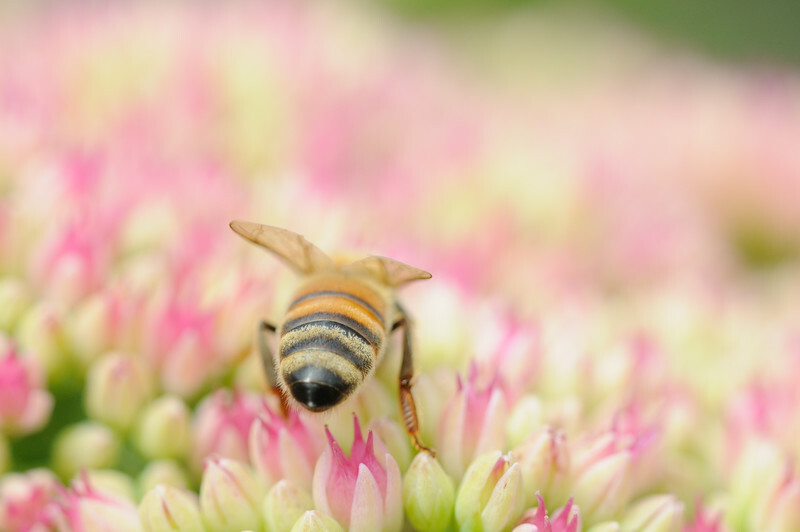 It's not easy to keep up with the bees as they scamper over the flower heads. Shooting macro at high magnification the autofocus couldn't keep up with the bees rapid movement, using manual focus I tried to predict where the bees were moving to keep focussing one step ahead. When shooting macro I use the same approach as I would when photographing vertebrates, getting down to eye level with the subject, focussing on the eyes and controlling the depth of field. However, with the bees I also tried to take a range of images including shots focussing on the striped abdomen, showing a part of the bee familiar to many people. 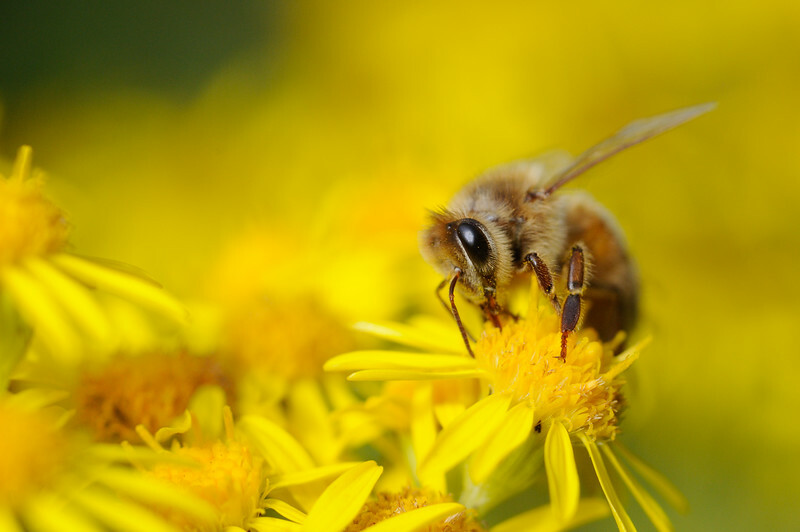 Flowering throughout summer ragwort provides an important source of food before the sedum starts flowering. Growing around our pond it's very popular with bees, wasps and butterflies. The ragwort is a taller plant however, and blows about on the slightest of breezes making macro photography difficult. Fortunately on the day this image was taken there was no wind at all. We used to have a buddleia bush which was very popular with butterflies and bees in mid summer, however it died last winter. I'll need to get a new one for the next few years, we've just bought a few lavender plants which the bees also love. 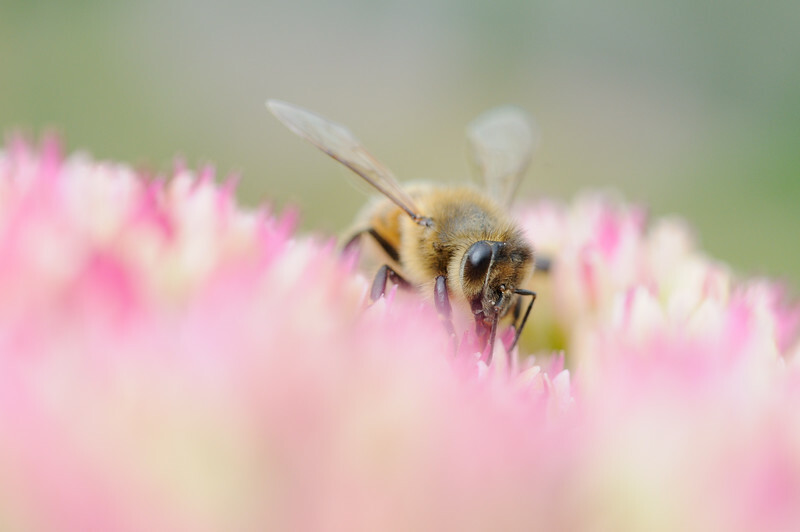 If you're interested in attracting more insects into your garden take a look at the following link for a list of flowers and shrubs to attract insects throughout the year. 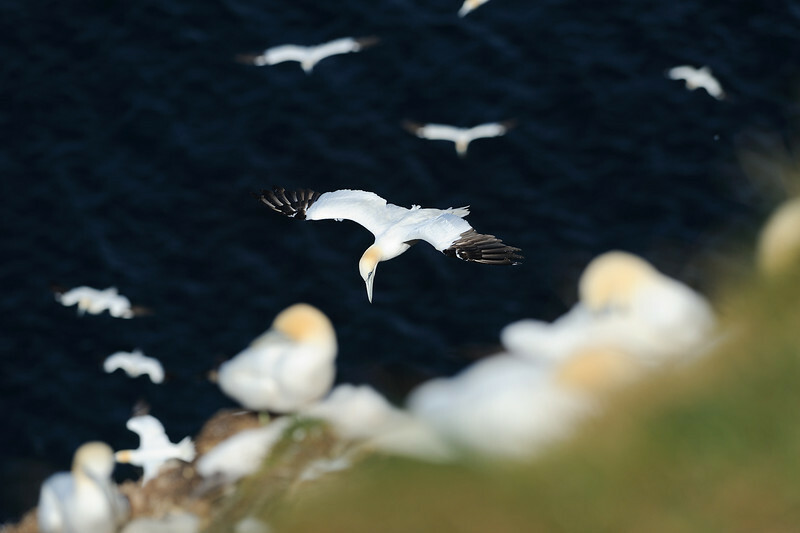 On the Aberdeenshire coast between the picturesque coastal villages of Crovie and Pennan lies Troup Head; home to Scotland’s only mainland gannet colony. 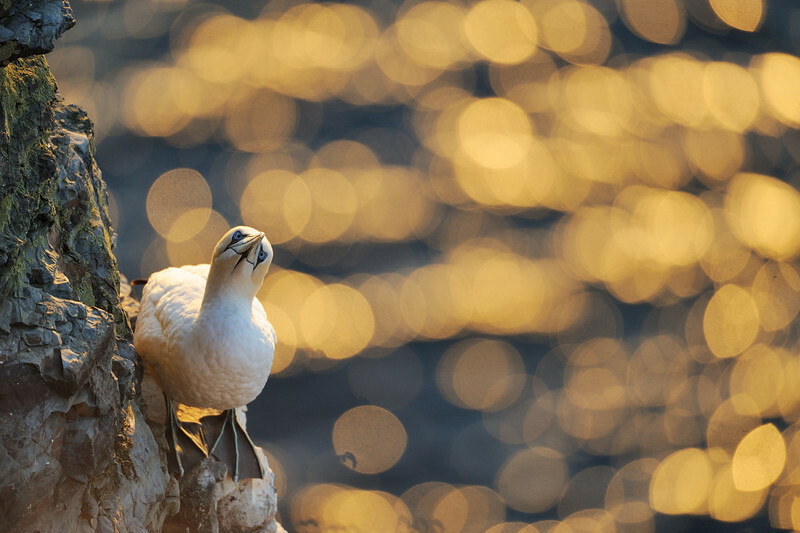 Each year 1500 pairs of gannets return to breed alongside 150,000 other seabirds. 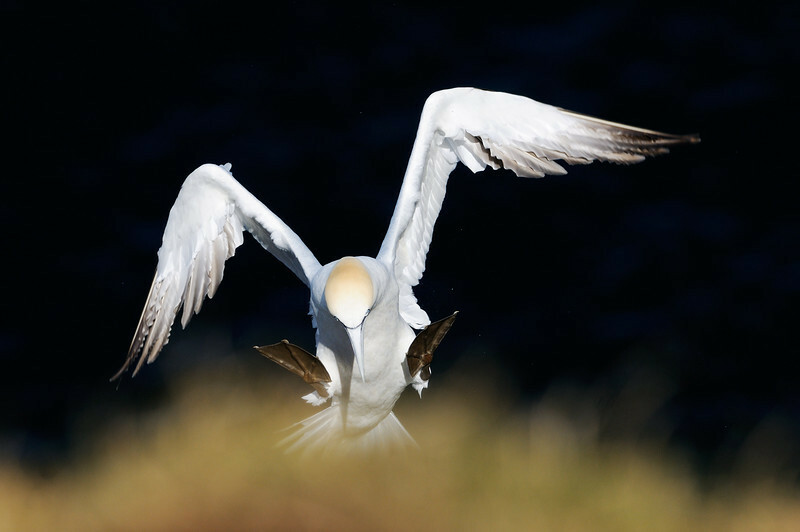 A special protected area and site of special scientific interest the 4km stretch of cliffs are also home to guillemots, razorbills, kittiwakes, puffins and fulmars. 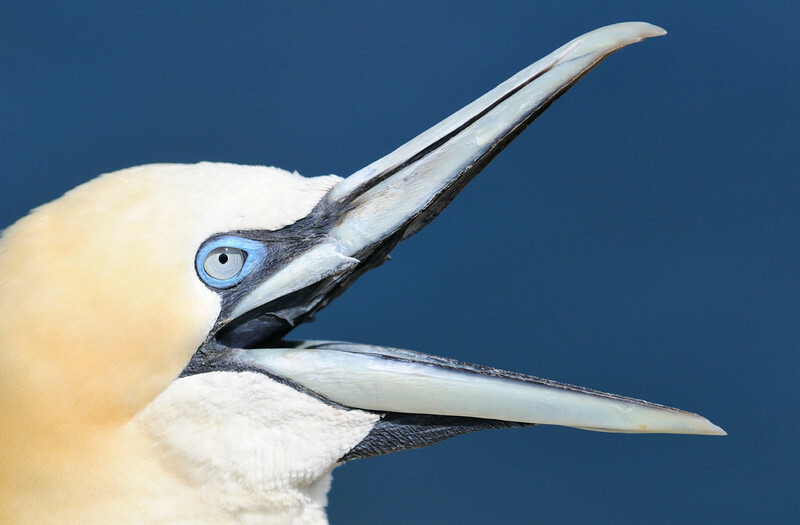 1988 saw the first recorded breeding with 4 pairs of gannets, believed to have originated from the Bass Rock to the South. The number of breeding pairs has greatly increased in the intervening years. 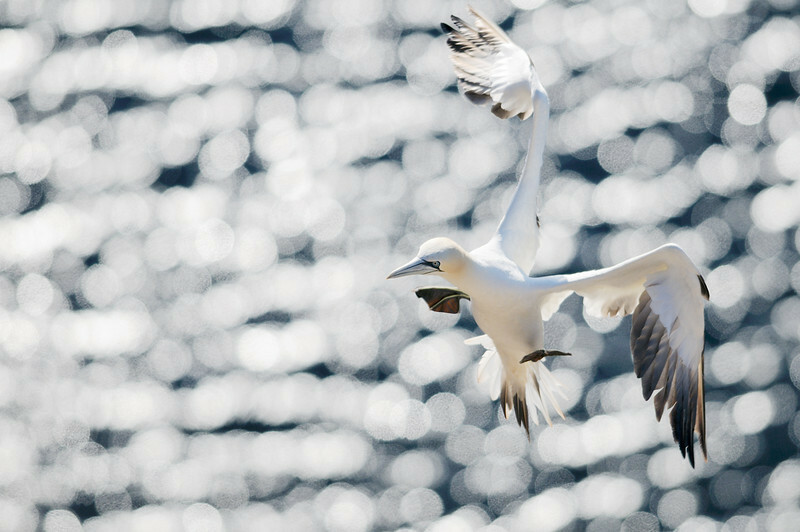 At the start of August I spent 5 days at the colony photographing the gannets as they went about their day to day lives. With very settled weather the ocean was flat calm, not a wave in sight. There was very little wind other than a light offshore breeze. This had a profound effect on the birds which were struggling to get any lift and were flying lower down the cliff face. On our first day we arrived late in the evening after the drive North. There was barely an hour of daylight left however, I was keen to head out to the cliffs to get the lie of the land. With the sun hidden behind a bank of clouds it was clear that there wasn't going to be any warm evening light. Walking along the top of the cliffs I tried to identify a few locations worth spending some time at the following day. 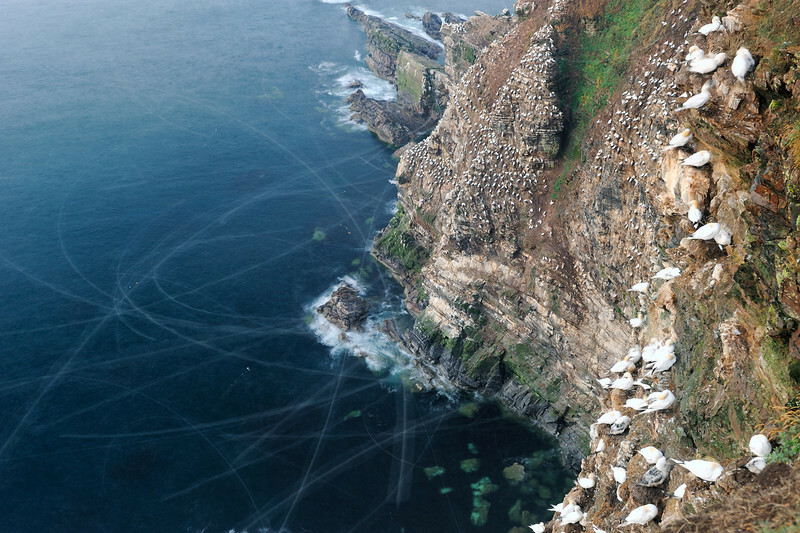 Most of the nests are lower down the cliffs and inaccessible. I feel that this worked to my advantage as it allowed me to really focus on just a few spots, giving me a good opportunity to capture a range of behaviours. The following day I returned to the cliffs which were bathed in glorious sunshine. There were a few more birds on the wing, although there was still barely a breath of wind. The North facing cliffs at Troup Head are in shade for much of the day during the summer months, however, this also provides the opportunity to shoot in warm evening light at the end of the day. With most nests lower down the cliff face, opportunities to get close ups were fairly limited, although I understand that on days with strong onshore winds, non-breeding birds often rest along the cliff tops. I spent sometime trying to get some clean simple portraits of the birds which required a bit of patience and sure footing! With a drop of 365ft you certainly need to be aware of where you place your feet and possess a head for heights, particularly if the wind picks up. Each day I tried and think of a new photograph to try and capture or a new view to incorporate into an image. 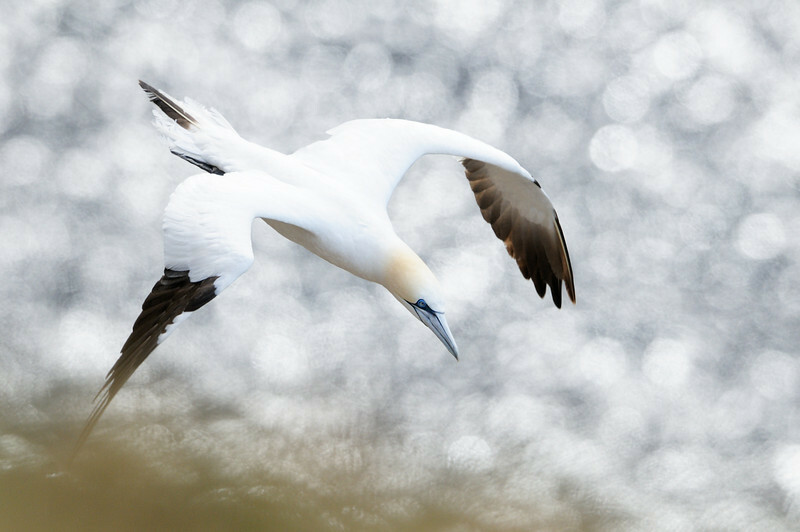 One shot I enjoyed trying to capture was that of a gannet landing head on with a black background giving clear separation of the subject. As the day wore on the sun moved further to the west and started to illuminate the cliffs, I started to focus on trying to get some shots with the gannetry behind. Midway through our week we went on a boat trip from Crovie to Troup on the explorer. As we left Crovie it was overcast yet, we remained hopeful of some late evening light. 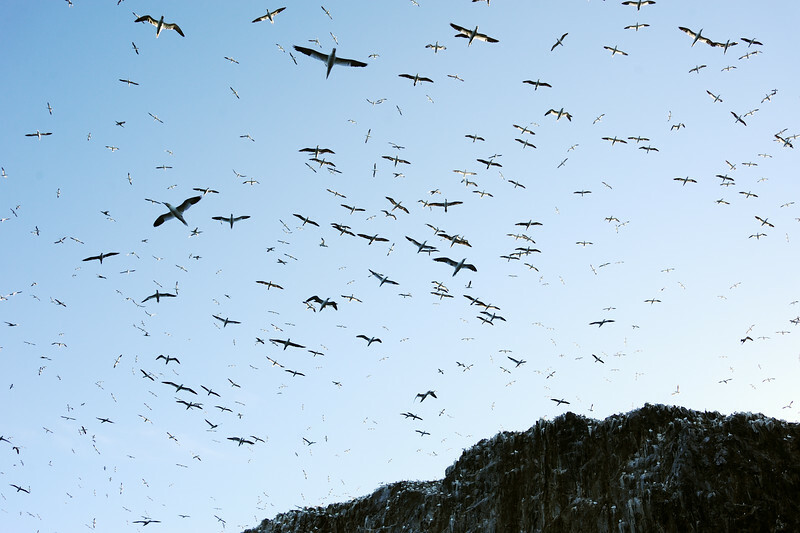 When we reached the cliffs it was still cloudy, drifting along the base the towering cliffs hundreds of gannets were flying overhead. Heading further East we took in the kittiwake colonies along the coast towards Pennan. As we headed back towards Crovie the sun dipped towards the horizon and the first beams of light began to break through. Passing Troup it was as if someone had flicked a switch, the cliffs illuminated in beautiful golden light. Around midday the light was often bright and harsh, ideal for high contrast backlit photos and abstracts. I really enjoy the challenge of trying to “see” a picture. It’s something I do far more when approaching a situation in a more artistic manner. I could be looking at small details in a scene or trying to incorporate an element of the larger landscape in an unusual manner. In this situation I was keen to somehow incorporate the shimmering water into my image. I did this by shooting wide open and waiting on a gannet to fly over a specific area of water. I spent a few days working on this type of shot waiting for the perfect conditions and composition before finally getting a couple I was pleased with. So often photographers take similar pictures to one another and therefore I think it's hugely important to try and do something a little different. Which is what I was hoping to achieve here. Shooting at this time of day almost forces you to think differently, to see differently; and that’s often the key to taking your best pictures. Like all nature photographers I often get shots in chance encounters. Yet the photographs I get the most pleasure out of are the ones that I've put a lot of thought into, the shots that I’ve spent hours envisaging before capturing. It’s that feeling of elation of finally capturing an image that makes the hours watching and waiting all worth while. As the day wore on the sun continued its journey Westward illuminating the cliffs with softer and warmer light. The sunlight was refracting on the waters surface, creating lovely abstract circles which added some interest to the background of the photographs. With these conditions in mind I kept my eye out for a situation that would make for a nice simple shot, when I spotted this pair preening I knew I'd found what I was looking for. On our final day the weather was changing, there was still an offshore wind but it had really picked up. However, with a swell building out at sea, waves were starting to crash into the base of the cliffs a creating much stormier looking scene. PLEASE NOTE THE BLOG CONTINUES ON THE NEXT PAGE. Along the cliffs many of the birds were held up in the frequent gusts that were blowing along the coast. I really wanted to capture a photograph giving a sense of this by having as many birds as possible in one shot. Looking into the light the key to success was to focus on a small section of cliff and wait for a strong gust. As the day wore on the wind started to fade and fewer birds were on the wing. I tried a few shots with a longer exposure focusing on a smaller part of the colony. I was hoping to incorporate the breaking waves, warm light and a few flight trails from birds coming into land. I'd tried this shot earlier in the day but it was't possible in the strong winds with the tripod being buffeted throughout the exposure. This was the only photograph I managed to get in the dying seconds of sunlight that was sharp and had multiple flight trails through the shot. 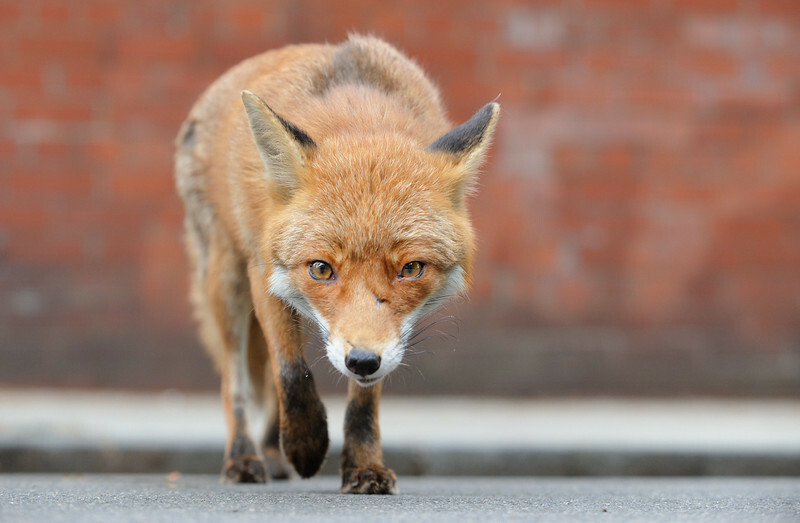 Urban foxes have been present in Glasgow for at least 60 years and are frequently seen in suburban gardens, parks and other open spaces. 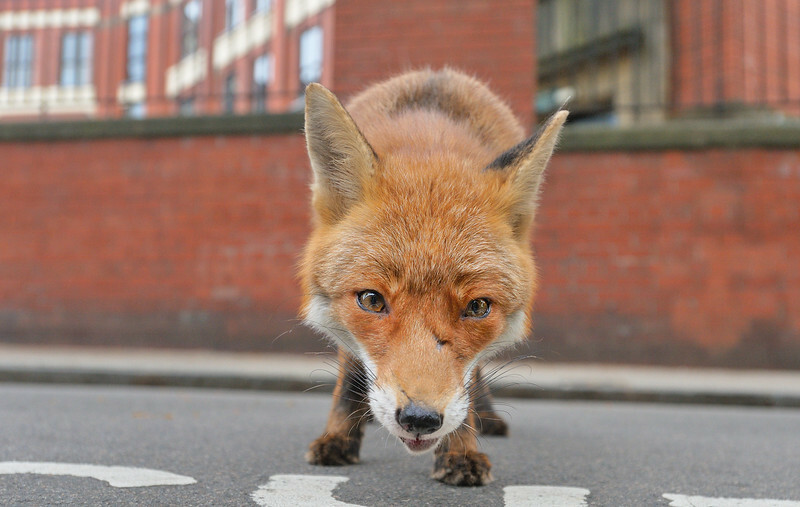 It's estimated that there are 33,000 urban foxes in British cities with research suggesting per fox there is 150 times the amount of food required available. When I moved to Glasgow in 2010 I became acutely aware of foxes, the walk back to Maryhill from a night out provided frequent sightings: sometimes it pays to be a nocturnal student! For the last couple of years I lived in the West end of the city and late night sightings became a little less frequent, likely due to the shorter journey back to my flat. Back home in Perthshire, I'd only ever seen 2 foxes, where they are very timid as a result of population control. I'd always been desperate to get the chance to photograph a fox and knew Glasgow was my best bet. 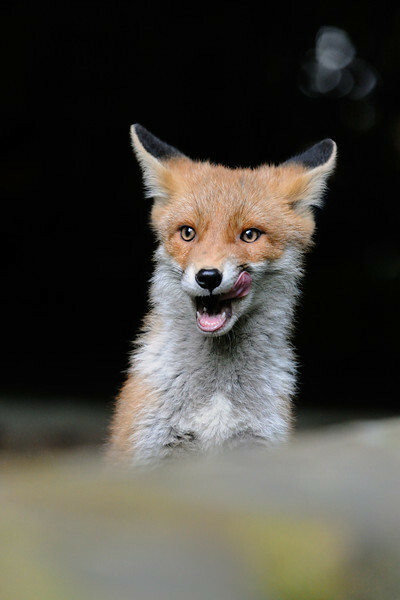 As the exam season drew to a close in mid May this year I began to have fairly regular sightings, even stumbling across a vixen out foraging for food at half past six one morning. It was my first ever sighting of a fox in daylight, which led to a number of early mornings out in search of foxes. The first few days were largely unsuccessful with only one sighting lasting for little more than a minute from 10 hours of sitting and waiting. I decided a more active approach was needed and started walking the streets in search of a fox or even better, a den. After a couple of days I investigated a hole going into a vent below a tenement. There were no obvious signs of foxes and I couldn't smell the pungent rich scent of a fox nearby, however, I decided to return the next morning just in case. And what a morning it turned out to be, approaching just after 5:30am sitting out in front of the hole was beautiful little fox cub. Slowly I set up my camera keeping both eyes firmly on the cub, waiting to see how it would react to my presence, I need not have worried. This particular cub was wonderfully inquisitive and came right up to me giving me a thorough investigation. About 20 minutes after my arrival one of the parents came into view across the street, trotting over with a carrier bag full of food in its mouth. It paused sparing me a glance before going into the den with the cub dashing in after it. A few moments later both came back outside, the adult jumped up onto the wall I was resting on, with the cub soon following suit. It was copying its parents every move, learning all the time. For a couple of weeks I returned every morning getting a few shots here and there. Light was always a limiting factor with the den hidden in the shade of a huge tree, the street itself running perpendicular to the morning sun. On one of the mornings the inquisitive cub was nowhere to be seen, the parents too were visiting infrequently and seemed a little agitated. This particular fox which I think was the vixen (it was hard to tell as I never got a great view of the genitalia) kept wandering between the den and a nearby street, I followed it on one such trip and managed to get this wideangle shot as the fox came right up to the lens to investigate. It kept visiting a small garden in front of one of the tenements and I could hear it softly calling on each visit. For twenty minutes it kept wandering back and forth along the street, each time returning to the same spot. As it returned to the garden I heard a rustle by a basement window, when it wandered off back towards the den I went over to investigate. I peered down the drop to the basement window and there staring back at me was the lost cub. It was shaking and looking rather distressed, with the drop around 2 metres the cub had no chance of escape. 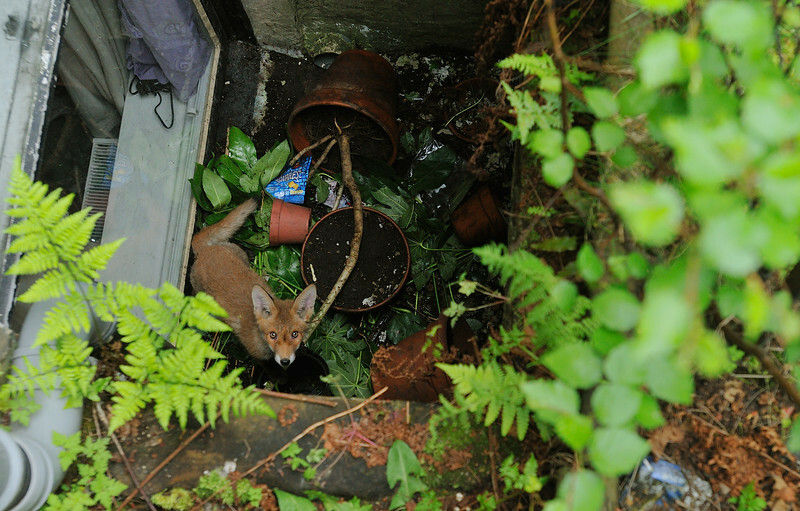 Clearly the vixen was also rather stressed unable to get down to her cub to the help it. It's likely it must have fallen down at some point during the night whilst out foraging with its parents. Whilst I probably could have jumped down and picked the cub up I undoubtedly would have gotten a nip for my troubles. With nobody answering in the basement flat I ended up phoning the SSPCA, who dispatched an officer to come take a look. When the officer arrived I talked her through the situation and showed her where the cub was stuck. She was rather astonished I'd managed to find a cub in such an unlikely and hidden spot but was delighted be able to help out. Once the cub was caught and lifted out it was desperate to be set loose, clearly not suffering any ill effects from the fall. The moment it was freed it was off like a shot sprinting back to the den. I must confess to feeling really delighted to have helped reunite the small shaking cub with the rest of its family. The next morning I was almost sprinting down to the den hoping to get a glimpse of the inquisitive cub. To my absolute delight it was sitting out in front of the den as if it was waiting to see me. I even managed to get this shot where the cub looked delighted to be reunited with the rest of the family. Sadly that wasn't the only story of hardship surrounding this particular family. 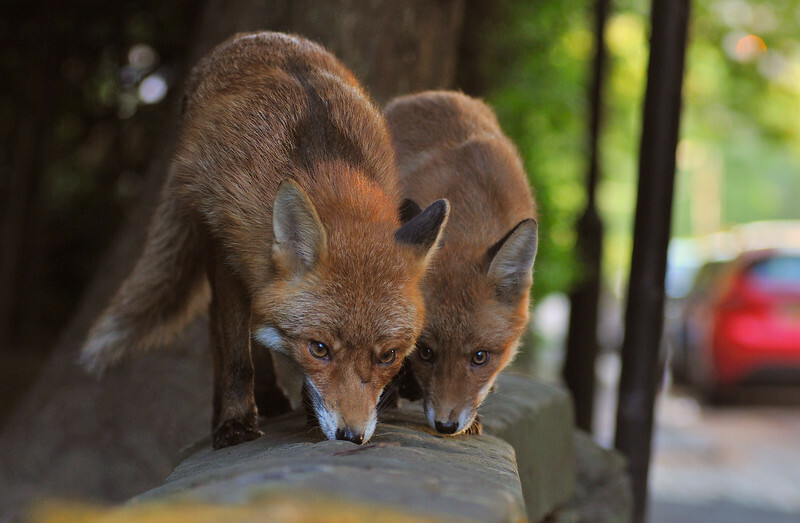 I had heard that on a few occasions someone had covered over the entrance to the den to prevent the foxes getting in to the cubs, something that must have been hugely stressful for the parents and the cubs alike. Fortunately this was always spotted by people aware of the den and any obstructing items were cleared away. 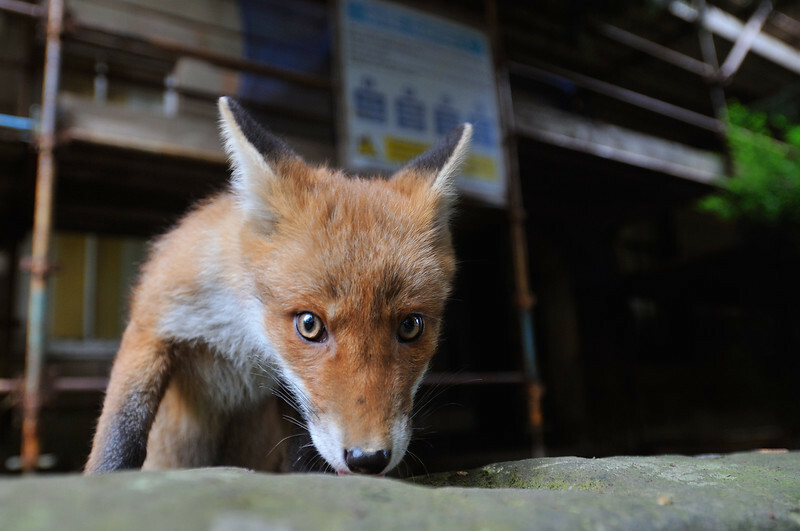 A local woman told me a really shocking story; on two separate occasions she'd witnessed someone sending a dog into the den trying to attack the foxes and chase them out for nothing more than the fun of it. Really disgusting behaviour and again something that must have been very stressful for the family. Fortunately the family seemed to have significantly more people looking out for them than trying to cause them harm. On several mornings different people would turn up with leftovers from the night before, watching the fox family as the cubs grew up and started to play outdoors. After hearing about some of the families trials and tribulations it was great to see people taking the family to heart and enjoying having such fantastic wildlife right in the middle of a city as busy as Glasgow. 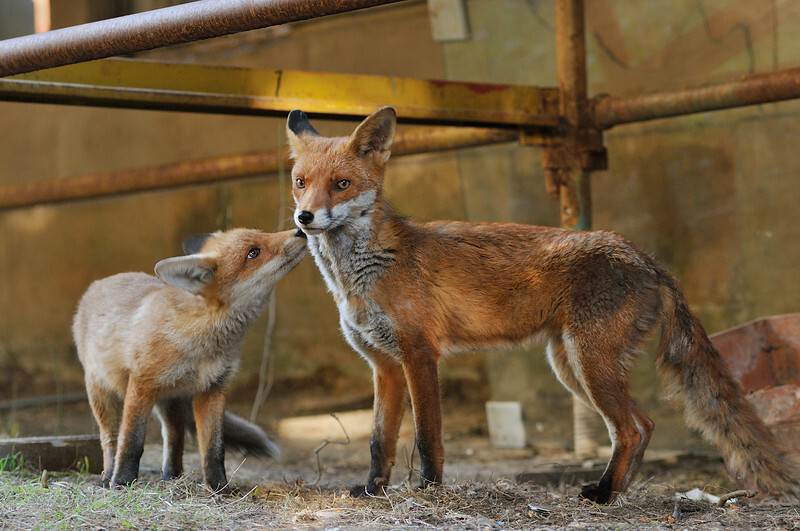 Spending two weeks with the foxes was such a fantastic experience. There's something really special about photographing big mammals; these foxes just had such character. As you can imagine I got rather attached to the whole family, but this one little cub in particular will always have a special place in my heart. 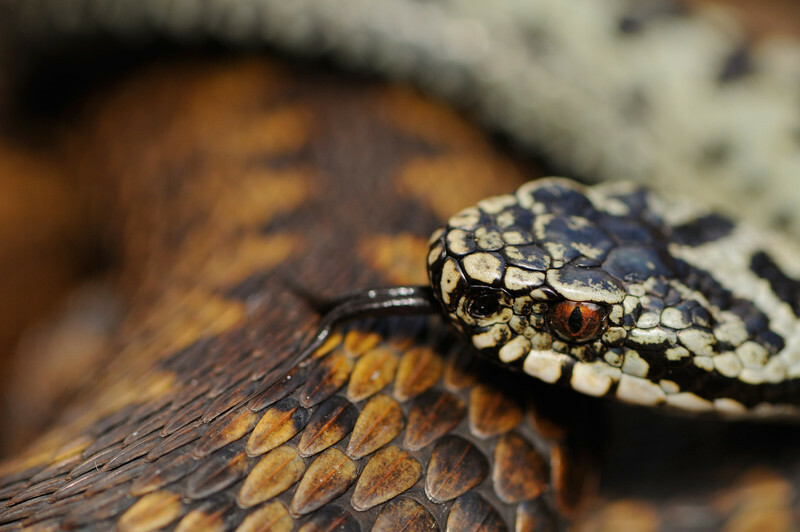 On Monday morning my father Lorne and I set off in search of the european adder (Vipera berus), an animal neither of us had seen in a number of years. We arrived at our destination and walked for about 15 minutes before reaching an area we'd heard adders frequented. The bracken covered slope faced south east, and at this time of year enjoys the early morning sunshine; a perfect spot for basking ectothermic adders. Spotting an adder didn't take long, Dad soon found an old snake skin and just a few feet away were a pair of adders mating amongst the bracken. 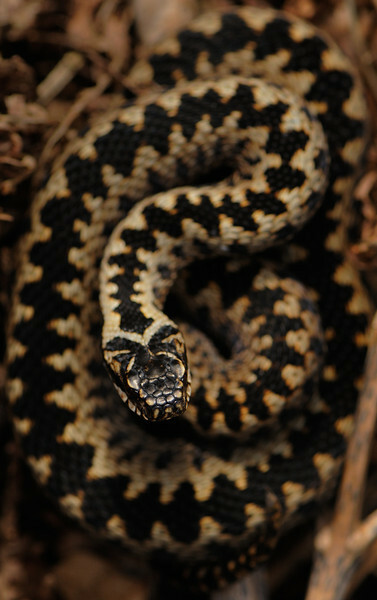 Over the next few hours at least another ten adders were seen in an area not much larger than ten metres squared. The females are larger than the males reaching up to around 60cm in length on average. They are generally brown in colour with dark brown to black markings zigzagging down the dorsal surface. The males although appearing smaller can be quite striking with more variety in their colouration, one particular male was a fantastic turquoise blue colour with dark black banding. Watching males attempt to mate with the females was fascinating as they constantly writhed around, coiling around each other with the bodies often appearing to be in a rather tangled mess. I spent much of the day with one female that was the largest snake in the area, she spent most of the morning mating with a dark coloured male in the undergrowth. By the afternoon she'd moved off to another patch of bracken and had lost the male, it was then that the smaller turquoise male followed her scent and found her. He spent a considerable amount of time trying to mate with her, however, she didn't seem very interested and remained firmly coiled up. Much of the time the male was simply facing the wrong direction entirely with his head down at her posterior tail! 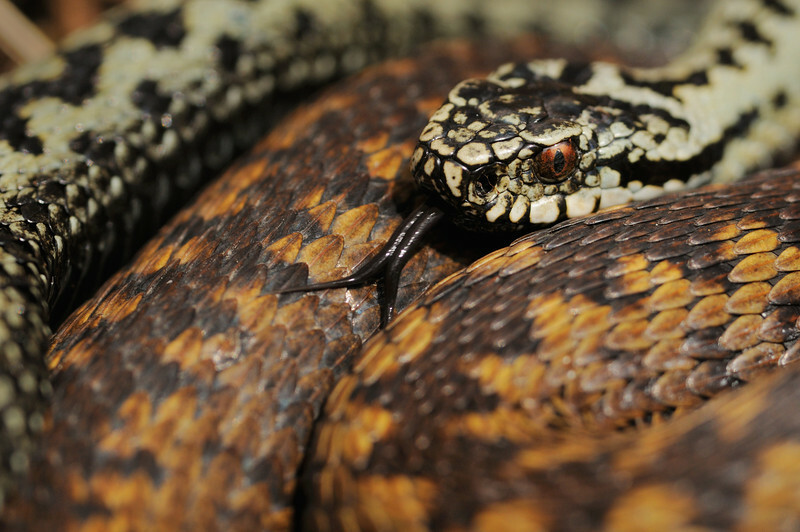 I was using a macro lens all day and was only a few centimetres away from the adders. Being venomous you of course have to be careful around them, however, I quickly realised the best course of action was simply to stay relaxed and lie still. 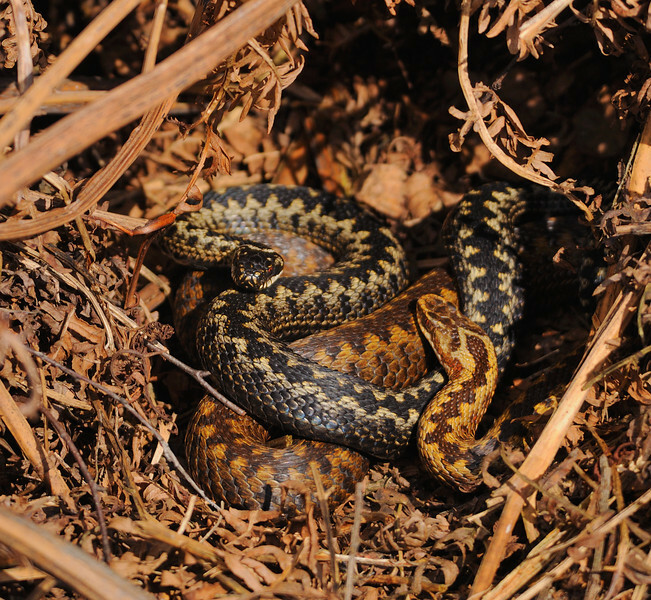 Doing this the adders took absolutely no notice of me. 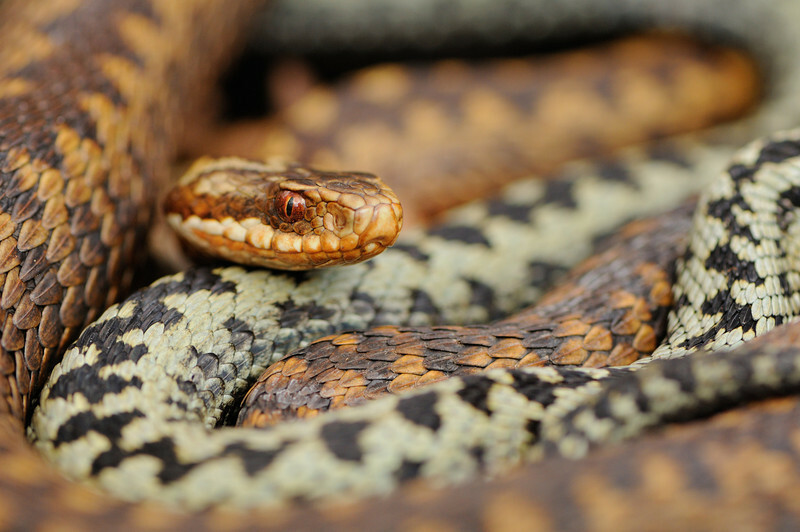 Several times throughout the day adders appeared out of the undergrowth right next to where I was lying and just by remaining still they moved by without even pausing. If I jumped up or moved quickly it certainly could have provoked a different reaction. It was really a remarkable experience lying there and having these snakes practically crawling over me, they were so close. Lying beside a female there was no shortage of interested males frequently coming and going often engaging in quick bursts of dancing with the dominant male she was mating with. 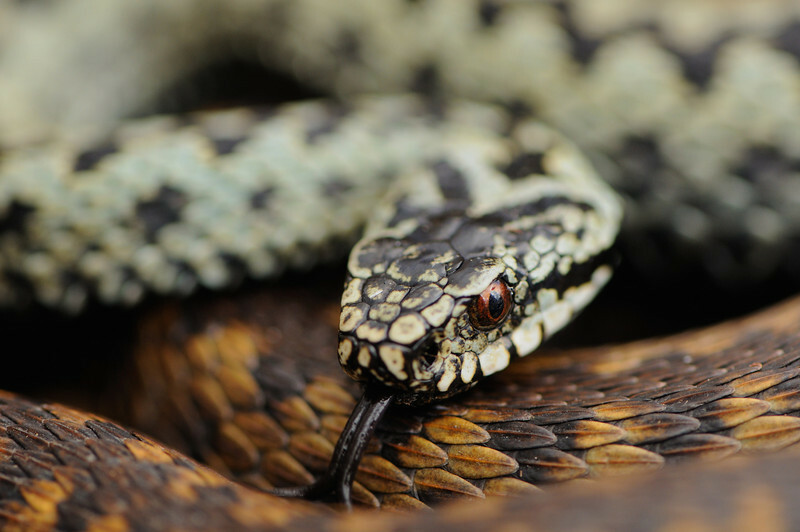 Adders use their forked tongues to pick up scents and the turquoise male was constantly flicking his tongue when he found this female. When the female was mating with the darker male earlier in the day both were constantly flicking their tails in excitement. Sadly for the smaller turquoise male he was the only one flicking his tail on this occasion. It was interesting watching him, anytime there was a rustle in the nearby bracken caused by another snake moving around he'd sidle off into the undergrowth and re-emerge a few minutes later. It was clear he was attempting to employ a sneak mating tactic, although unfortunately for him the female was having none of it! This shot shows the female on her own after the blue male had hidden in the bracken at the sight of another passing male. Later in the day he mustered up the courage to engage the darker male with which the female had been mating with earlier, however, he was unsuccessful with the larger male easily seeing him off. 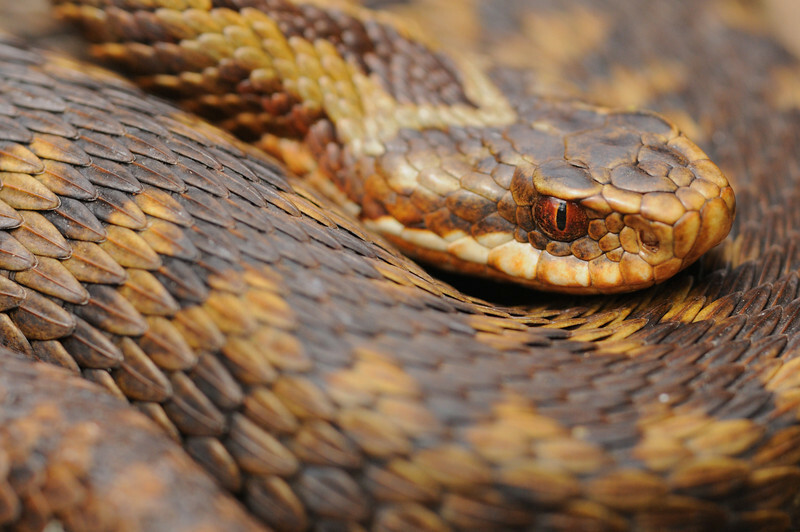 The adders are easily identified by a distinctive 'V' shape at the back of the head which in folklore led to the name viper. 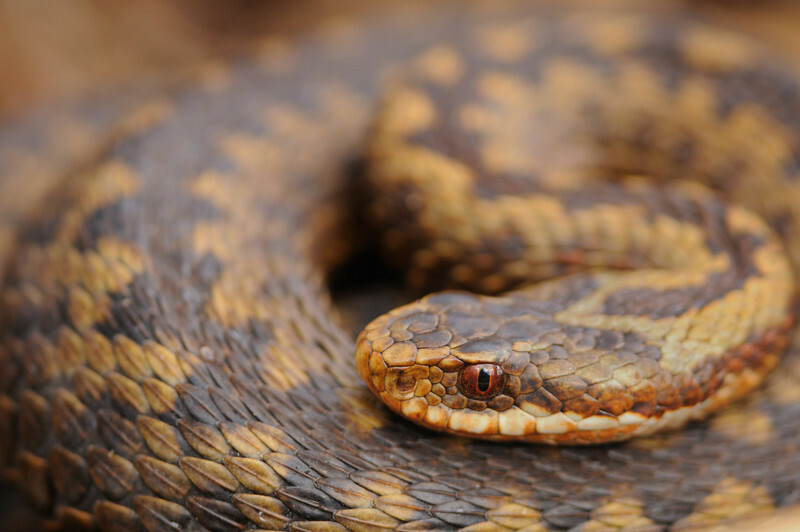 Adders are ovoviviparous which means that the females give birth to live young; although the young develop inside eggs in the female before hatching out of a membranous sac being born in late summer. Although the turquoise male was unsuccessful in mating with the female he was undoubtedly the star of the show. He was the most beautifully coloured snake I saw all day and I had the most incredible fun photographing him and his antics. The whole day was one of the best experiences I've had in years, I couldn't stop smiling. 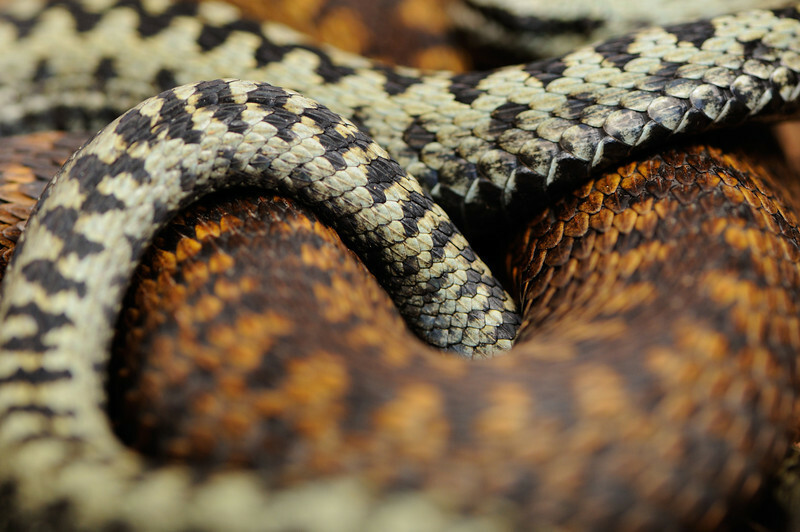 All around me adders were constantly appearing and disappearing, fighting and mating; it was just the most fantastic beautiful Spring day. I certainly hope that it's not another ten years until I see an another adder. 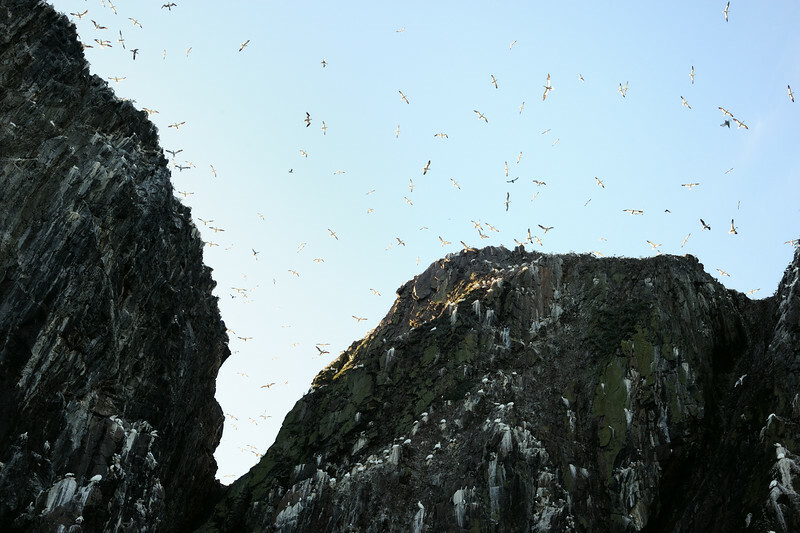 In the summer months Scotland plays host to numerous internationally important seabird breeding colonies such as the Bass Rock and Isle of May, which I briefly visited last week. 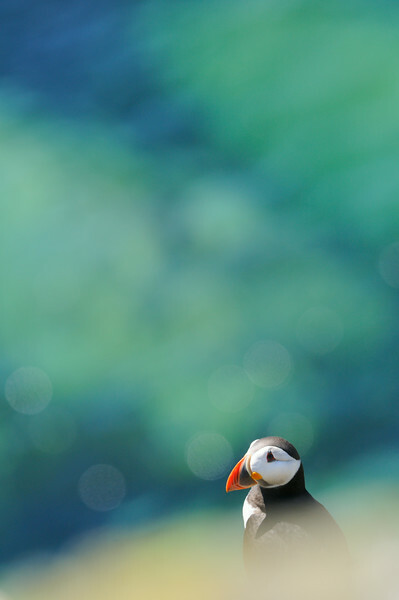 The UK is home to almost half of the breeding seabirds in the Europe with approximately 70% of those birds nesting in Scotland. For some species this figure is even higher. 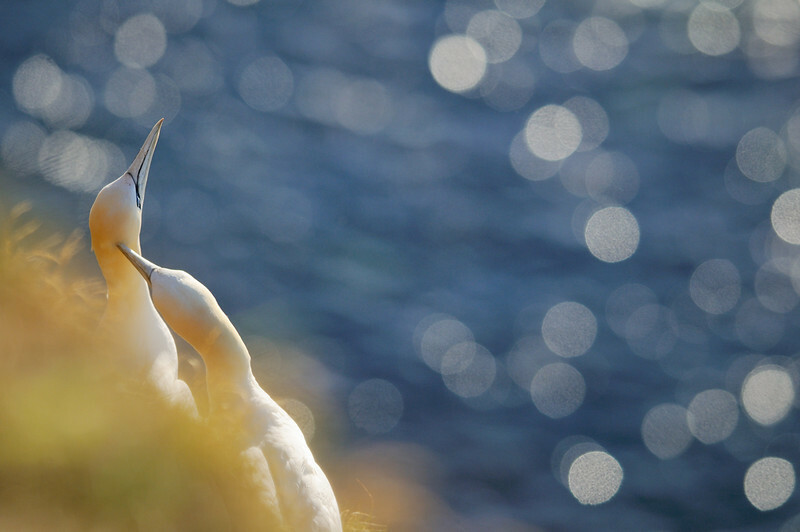 Every year 182,511 pairs of gannets nest in Scotland, 83.5% of the UK population. The Bass Rock in the outer Firth of Forth is the largest single rock gannetry in the world with over 150,000 individuals. Setting off from North Berwick we soon found ourselves sailing along the bottom of the spectacular cliffs on the north west side of the island. 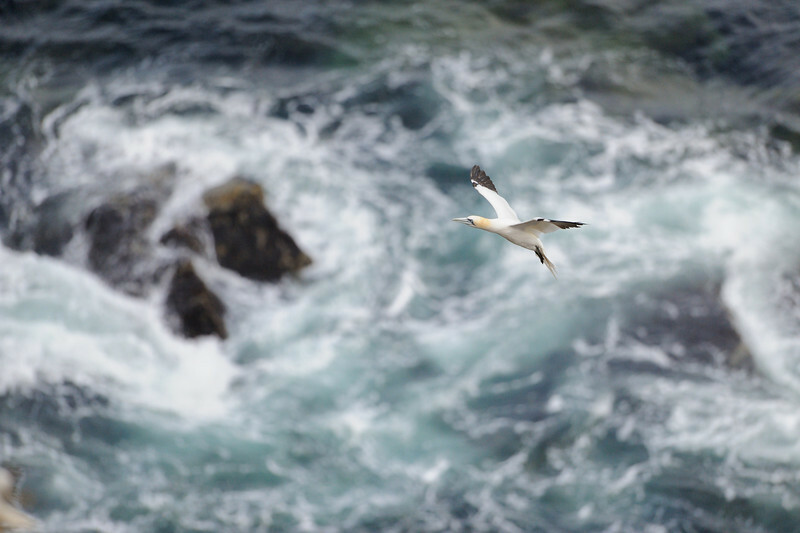 As we approached we were greeted by this spectacular view with thousands of gannets flying overhead. Nest space is at a premium on the Bass with so many birds present during the breeding season. 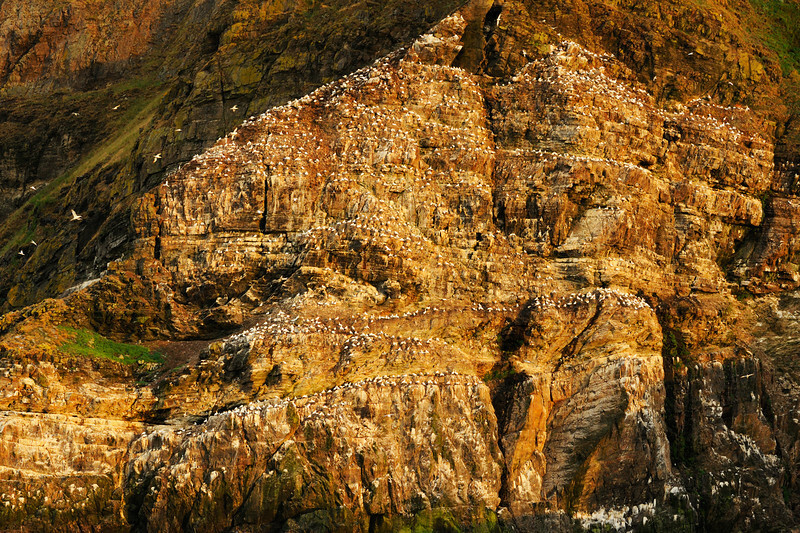 This overcrowding is thought to have contributed to the establishment of a breeding colony at Troup Head 112 miles to the North on the Aberdeenshire coast. The first birds started to colonise in 1988 are thought to have originated from the Bass. 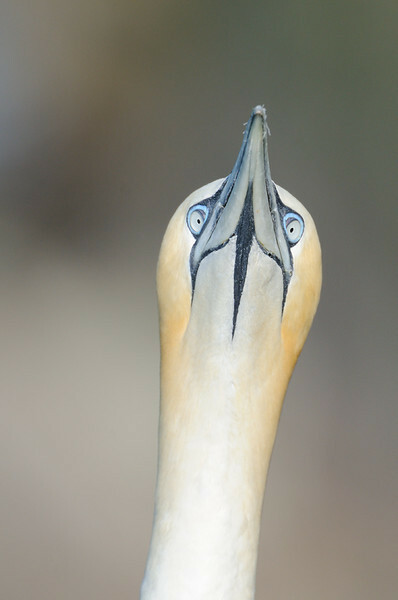 Gannets are synonymous with the Bass Rock, to the point where they even derived their latin name (Morus bassanus) from the island. After ten or so amazing minutes at the Bass Rock we headed off towards the Isle of May. Even with a fairly calm sea the rib we were travelling on was bouncing and gliding over the top of the waves, the sudden fall into the occasional trough was exhilarating and great fun. When we landed on the May we were given a short introduction to the island before heading off to Bishop Cove. This was a great spot from trying to get some flight shots of puffins as the circled, waiting on the chance to return to their burrows without catching the attention of lesser black back and herring gulls patrolling the island. 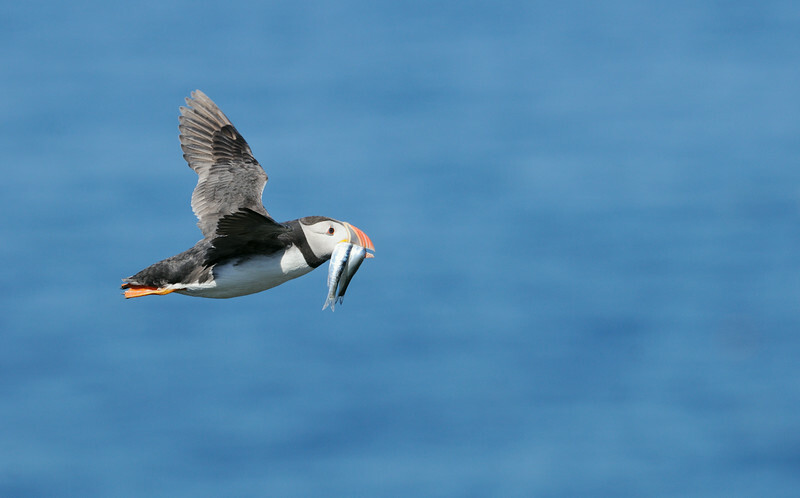 Many of the puffins were carrying mouthfuls of sand eels and other larger fish. This particular bird certainly had a mouthful with these two (relatively speaking) huge fish! We had just under three hours to spend on the island before heading back to the boat, so before long we headed off towards the South Horn to explore some more of the island. 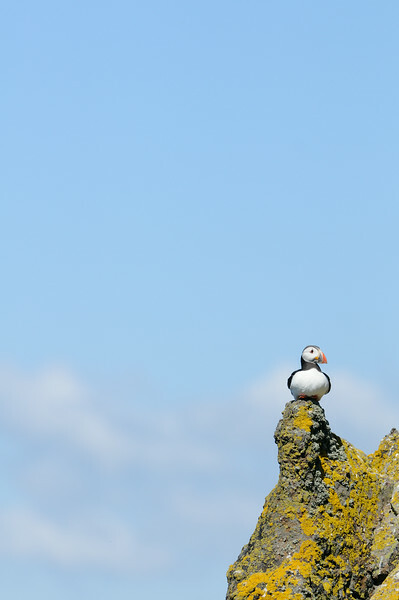 As we walked along the top of the cliffs I noticed this puffin sitting high and proud on a small lichen covered tower of rock. I headed further along the path to then shoot back with the midday light. 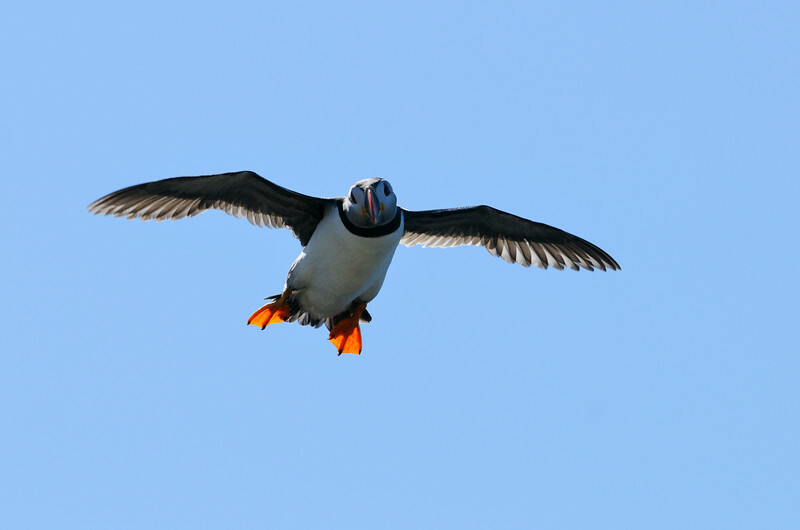 This year there were an estimated 45,000 occupied puffin burrows on the island, at this time of year it really was buzzing with wildlife. We even got to see a puffling up close! 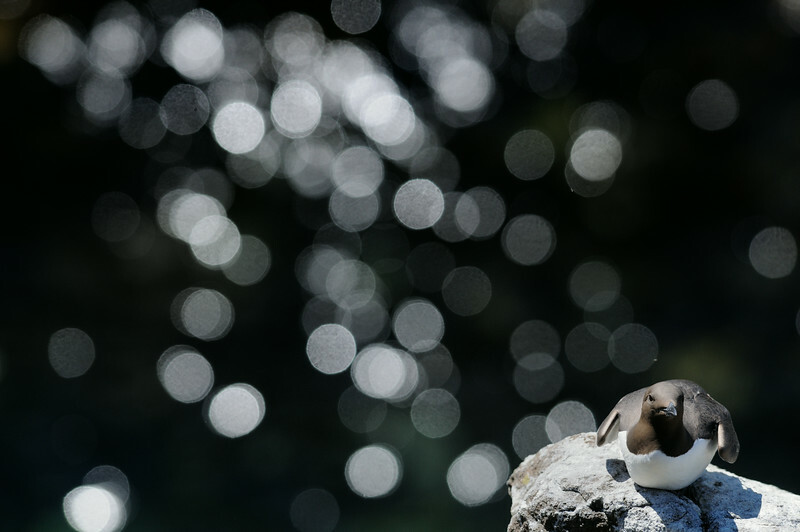 As we headed down to Fluke Street a greater black back flew overhead carrying a puffling when suddenly it managed to wrangle free and fell from the sky, bouncing off the nearby rocks and landing at our feet. Any pufflings which are found out during the day are collected by the volunteers and staff working on the island and put in a box until nightfall before being thrown off the cliffs under cover of darkness. Whilst this may sound cruel its infact quite the opposite. When at fledging age pufflings natural instinct should tell them to leave their burrows in very late evening and make their way to the edge of the cliffs. 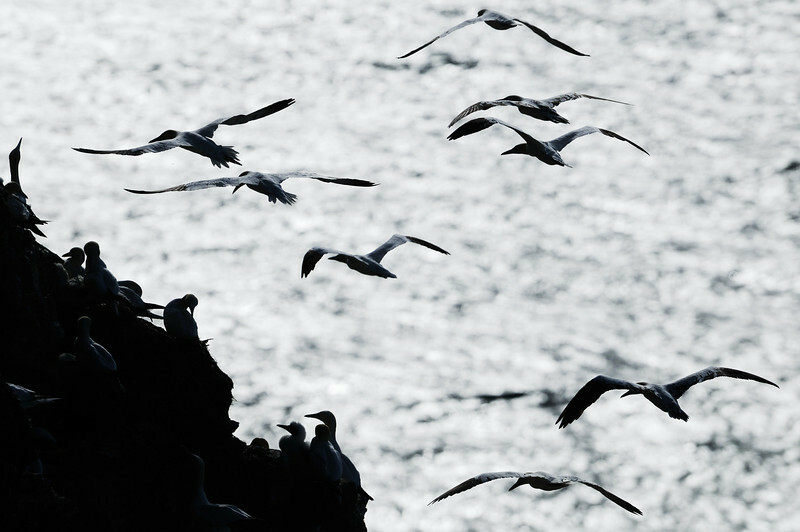 The birds leave under the cover of darkness to avoid the many predatory gull species that predate them during the day. Once at the cliff edge the pufflings jump off and glide down to the water below, even at this early stage they are by themselves and have to be self sufficient and forage straight away. In four years time the young birds may themselves return to the island to breed. There are numerous other species of seabird nesting on the island in summer with 14,000 pairs of guillemots, 2,400 pairs of razorbills, 2,300 pairs of kittiwakes, 500 pairs of shags and 360 pairs of fulmars. Whilst many of the guillemots were on the nest watching over their chicks I found this lone bird sitting sunbathing by the South Horn. 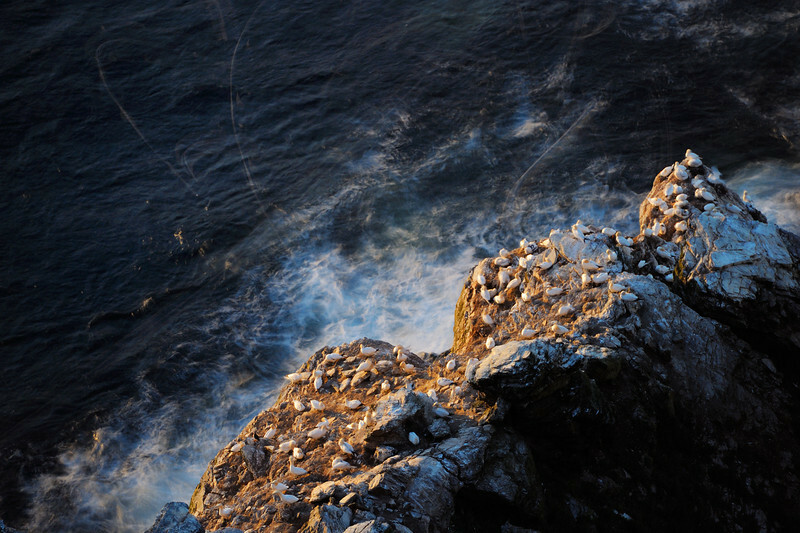 The sea below was shimmering in the midday sun allowing me to create this shot. 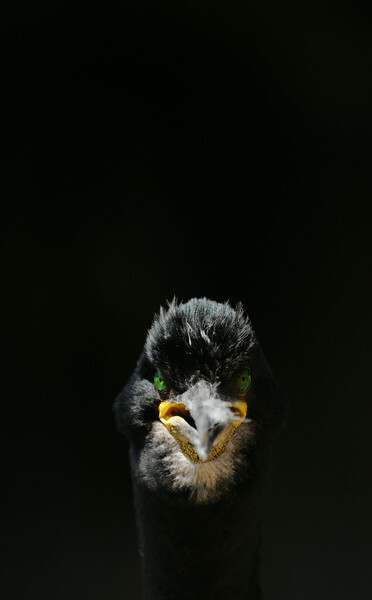 There were numerous pairs of shags nesting on the cliffs by the South Horn. With some nests just a couple of metres off of the path. Shooting into the light, the cliffs behind were bathed in shadow allowing me to capture this intense portrait. All too soon we were headed back towards the pier to catch the boat back to North Berwick, I made sure to give myself 10 minutes at the new visitor centre where there were fabulous views of the arctic tern colony below. Even standing under the roof wasn't safe with a few terns coming under the roof mobbing there too. 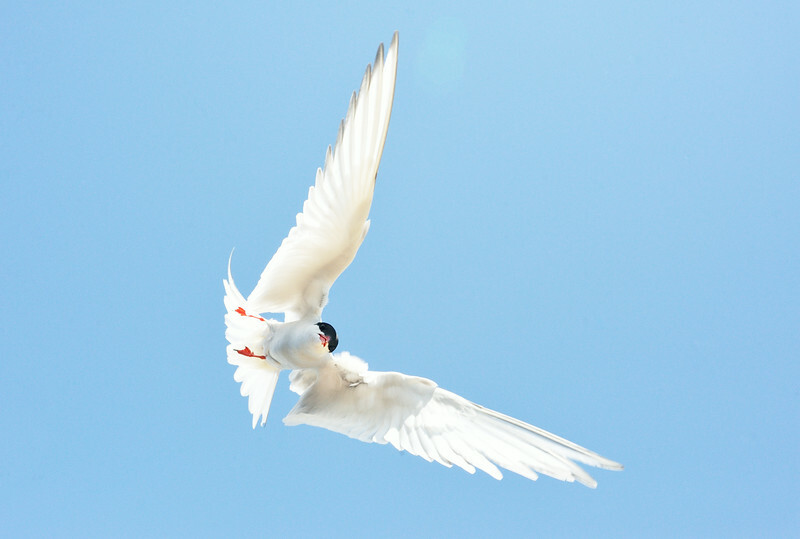 Here's a final shot from the day showing a tern about to have a peck at my camera, held high above my head as protection from their (very) sharp beaks. All in all a great day out and well worth a visit on the daily boat trips from Anstruther in Fife. At the bottom of our garden we have a large Chinese rowan tree (Sorbus glabrescens). Each year a mistle thrush takes up residence in early autumn, chasing all other birds out of the tree to secure the food source for when times are hard. This tactic usually works until the weather turns colder and food becomes scarce. 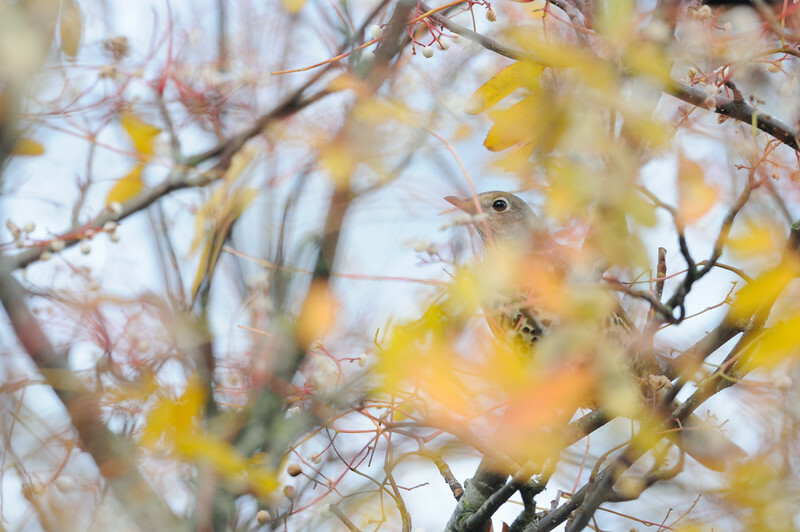 At this point flocks of thrushes usually discover the tree and overrun the mistle thrush. When this happens the tree can often have upwards of 15 birds in it at any one time. 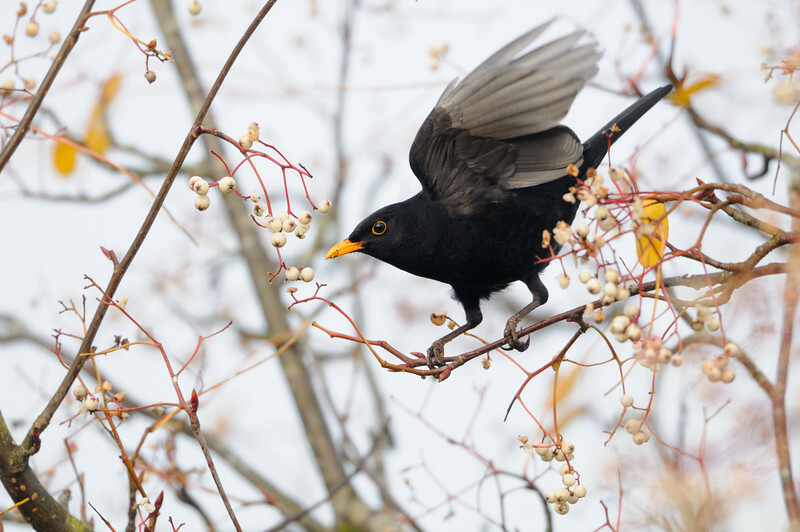 With so many birds coming and going from the tree it is usually stripped of thousands of berries in a single day. 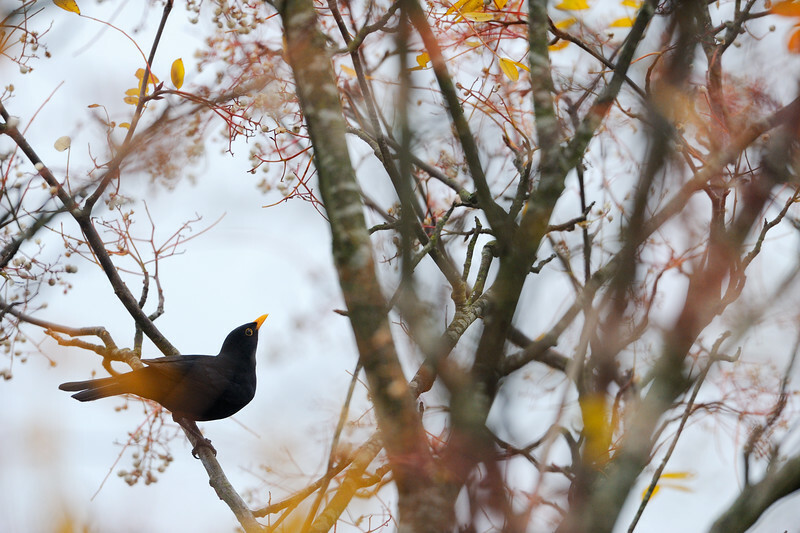 This year the tree was mainly stripped by blackbirds, along with a couple of redwings and a lone fieldfare. Rather than capturing just close ups I was keen to incorporate some of the branches, berries and leaves in my images. Photographing with a narrow depth of field added the subtlety and colour into the final images I was looking for. It was a dull day, typical weather of late! At midday I was shooting on my trusty D300 before switching to the D3 as the afternoon wore on. Berries are an important food source for many species of birds, particularly at this time of year when there are few insects about. 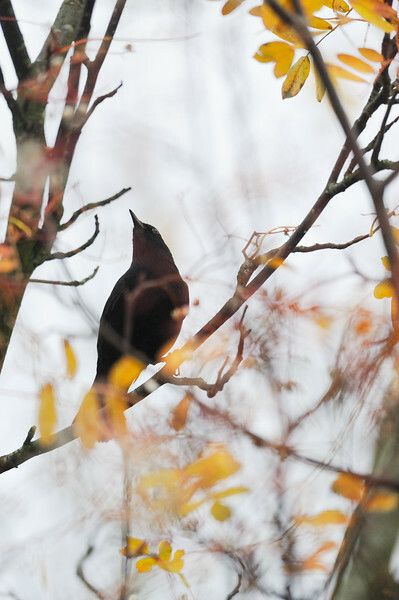 Species such as song and mistle thrushes, blackbirds, redwings and fieldfares, find most of their winter food from berries. 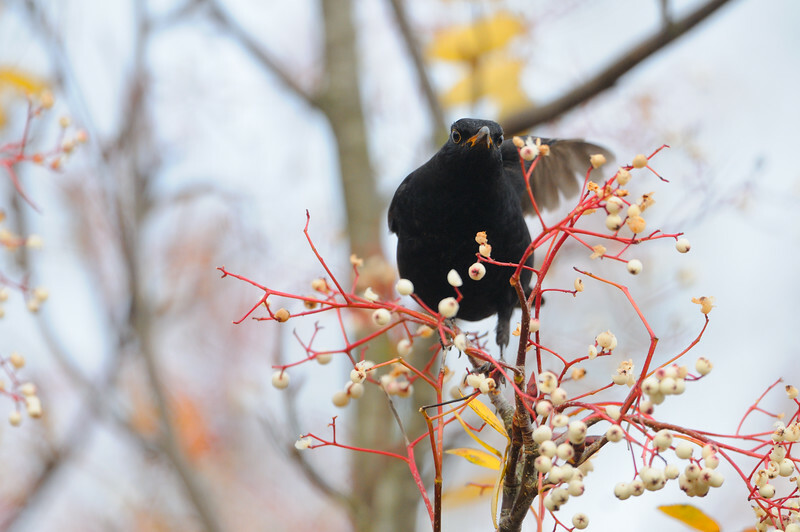 Plants produce berries as a way of encouraging birds to distribute their seeds. Rowan trees produce berries surrounding its seed in juicy, fleshy pith, which provide birds with with vitamins and energy. The seeds are carried by the birds as they digest the pith and can be dropped many miles from the where they were eaten. Thrushes prefer berries with smaller seeds, like rowan, as they are only really interested in the flesh. Other species, such as hawfinches make use of the seed itself, and are attracted to berries with larger seeds like hawthorn. Whilst the blackbirds were fairly tame and accepting of me standing nearby the mistle thrush, redwings and fieldfare tended to stick to the far side of the tree. This is one of the only images I managed to capture of the mistle thrush and it's one I'm fond of as it shows the timid character of the bird, peering at me through the leaves. Almost keeping a watchful eye on me between feeds.